At first sight one’s natural response might be to withdraw from Bajinath, a small thickset man of about 35 years of age. On his forehead and nose there are a number of nodules, with the same type of nodules on his arms. However, it is the sight of his legs that cause many to back away when they see him coming. Both legs are covered in nodules, some of them weeping pus, and also scarring from many previous ones. His legs are covered in a black shiny film that looks like tar. He told me it was a mixture of oil, human hair, grass and burnt cloth all mixed to a paste and smeared on his legs which he hopes will help to heal these nodules that cause him such problems. He is confident it will. Bajinath was happy to tell me his story to help my country people understand the different problems faced by many in Nepal. He began by telling me of his family- he has only one older brother and both his parents died some time ago. He was born in Ratoli a small village in the Mahattori district of Nepal. He married about ten years ago, from that union he has one son, his one desire was to improve life for his family. In order to accomplish that he went to find work in Delhi, and was fortunate to find well paid work in a Dehli factory. The plan was to work for a while then send for his family to join him. After two long lonely years, holiday time finally arrived , he could go home and visit his family. His return to Nepal did not turn out as Bajinath had planned. Instead of the happy reunion with his wife and child he was devastated to learn that his wife had gone! She had abandoned his young son at her parents house, and run off to marry her younger sister’s husband. All this he learnt from his neighbours, he could not comprehend the news nor why no-one had told him while he was in India. Stunned and unsure as to what to do the usual practicalities soon took over – he needed to eat and get his son back so he managed to get farm work in Bugara, a neighbouring village. The farmer was a kindly man and gave Bajinath a room near the farm. Sadly his in-laws refused to return to him his four year old son and so he was forced to enlist the help of the local police. With their help he gained custody of his son, they also brought his wife back but she quickly ran away again. He let her go deciding not to pursue her again. Having been in India for two years, he was now unsure of what the future held. Bajinath decided to put the past behind him and try and make a life for himself and his son. Despite all that had happened he felt quite optimistic that was possible. Then came the unexpected, his health began to concern him, he noticed small white patches on his skin he was afraid it was a serious disease. Some neighbours advised him to go to Lalgadh Hospital for tests, which concerned him even more as he knew that Lalgadh specialized in leprosy. Though he was afraid. he summoned his courage and went for tests. He was greatly relieved when told by the Doctors that he did not have leprosy at all but Kala azar. He began treatment thinking it would soon be cured and he could get on with his life, but the medicine did not seem to help! His skin got worse and more nodules appeared with many became infected and oozed pus. Kala azar is a disease caused by the bite of a sandfly which is very common in this part of Nepal and in North India. The highest incidence in the world is found here in Dhanusha and Mohattari districts of Nepal. It is often mistaken for Leprosy with dire consequences, and, if left untreated can be fatal. Bajinath began to experience difficulties with his neighbours as they did not believe him when he told them he did not have Leprosy. They were afraid of his disease affecting them. No matter what he said he could not convince them that he did not have Leprosy. 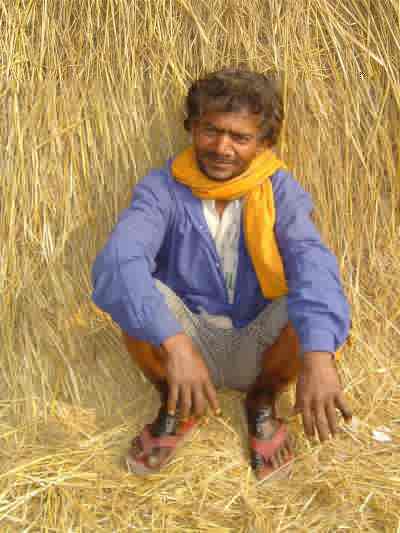 Not only did he lose his job because his boss thought he had Leprosy but the villagers threw him out of the village along with his young son. The villagers threatened him with violence if he did not leave willingly. He was forced to live in a tent made from plastic and begged for a living and he was very concerned for his son’s safety. Bajinath felt he had lost control of his life and that the Kala azar disease had taken over, feelings of powerlessness swept over him. How could he change this situation he found himself in. Often being subjected to verbal abuse and threats of violence from local people he slowly became despondent and depressed. All those around him were afraid they might catch his disease. It was in his tented home that Bajinath was found by the Self Help Group (SHG) Facilitator, Mr Muslim. Mr Muslim is a person affected by Leprosy and has received treatment at Lalgadh. He is now free of the disease but not free of the consequences although he is an intelligent compassionate man. He knows only too well how much damage can be caused by ignorance, having been the object of abuse himself. Mr Muslim now runs the SHG supported by NLT, and he is a very caring man and works hard to help others who have had similar experiences to his own. Mr Muslim spent time with Bajinath listening to his story and he eventually persuaded Bajinath to attend the group. When Bajinath’s living area became more dangerous the group gave Bajinath and his son, now 7 years old, a room in their meeting place to live. The local village officials in Loharpotti are very supportive of the SHG and gave the old health post building as a meeting place for the group. Many folk meet there now and of these most are affected by Leprosy but there are others with disabilities and some who are very poor and struggle to survive each day. Bajinath was unable to pay for his son’s schooling so he was able to attend the child literacy classes run through the SHG. Bajinath really wants to work and support his son himself but his skin is bad and no one will buy vegetables or any food from him. The group continue to encourage and support him as they are able but he feels that his dream is just that – only a dream, dreaming of selling cakes and biscuits from his own shop. The reality is that until his skin heals it will remain a dream. He is grateful for the companionship and support of the group; meeting with others that have endured the consequences of ignorance helps him. To feel accepted and valued by the people of the group has gone a long way to mending some of the hurts but much still remains. Recently we heard from Mr Muslim that Bajinath had found temporary work re-roofing a house. It may not be much, but it’s a start. The STEP Self Help Group members work to remove ignorance about Leprosy and other diseases and to help practically those whose lives have been turned upside down by ignorance. They are supported by Lalgadh Staff who go out weekly by motorcycle to listen to problems and offer advice, often working past their allotted hours, and they travel considerable distances to reach many of the groups. Some groups are about two hours travel from Lalgadh over dirt roads. It is monsoon now so the roads are made more dangerous by floods and copious amounts of mud. Remember Bajinath as he tries to regain control of his life and the young people who support him.